The question about what is basic compressor maintenance comes up fairly often in questions on the ASK page, and on the troubleshooting pages on this website. The content of this page is not aimed at the industrial air compressor owner and user, though the principles referred to apply to those air compressors as well. This is a guide to what you can do to make sure your air compressor runs as long as possible between failures. Simple things… yes, but things that a lot of smaller, DIY air compressor owners overlook. What are we talking about when we say basic compressor maintenance? This guidance is aimed at compressors like the ones you see here. 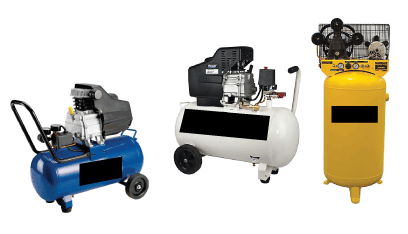 Many air compressors have motors that are equipped with a fan. You often cannot see the motor cooling fan as it is encased in the compressor cover. If you are air compressor has one, there could be gaps or openings, maybe a grill of some sort, that allows air to be drawn in by the motor fan, and passed over the motor to remove heat. Heat buildup in compressor motors accelerates the wear on the motor, and heat must be pulled or blown away. Even if your air compressor is located in a fairly clean area, the amount of air that is passed over the motor is huge, and even small amounts of air borne dust will accumulate, blocking cooling air flow. Inspect the housing of your air compressor regularly to ensure that all air paths to the compressor are free of dust buildup. If your air compressor has cooling fins on the pump, and they are accessible, use compressed air to blow the dust off them regularly as well. A cool air compressor is a happier, longer lived air compressor. As you may have seen in many locations on the pages of this website, air compressors generate water. That water ends up in your compressor tank, and can, over time, flow from the compressor tank down your air lines. The buildup of water in the compressor tank can actually reduce the space available for compressed air, turning a 6 gallon air tank, quite quickly, into a 3 or 4 gallon tank through water buildup in the tank. This makes your compressor cycle more frequently. Drain the compressor tank daily if you use it daily. Or, just get in the habit of opening the tank drain, with some compressed air in the tank to help blow out the water, at the end of every compressor use. Draining the compressor tank will help in the longevity of the compressor tank as well, reducing the potential for rust buildup and perforation of the tank. Is the air compressor make and model you have oil lubricated? Over time air compressors consume the oil in the sump, and frequent use of the air compressor will deplete the oil reserve more quickly. If your air compressor is oil lubed, it will typically have a method of checking that oil, and you need to do so, frequently. Look for a sight glass under the oil fill tube or pull the oil fill cover / dipstick to check the oil level on your air compressor. Having said that, do not overfill the oil sump either. Too much oil can cause maintenance issues with air compressors. Change the compressor oil according to the schedule in the manual, and if you don’t have a manual, consider changing the oil at least once a year, depending on compressor use. In a word, don’t! An extension cord can reduce the flow of power to the compressor motor below its designed power supply, and in time, that will degrade the motor itself leading to sooner compressor motor failure. If you need air a long way from where the compressor is, consider adding air hose not and extension cord. Yes, a longer air line means pressure and flow loss, but air tools typically are not damaged from a low air supply, but an electric motor can sure be damaged by a too low power supply. If you must use an extension cord, make sure it is one rated for the power demand of your compressor motor, with a thick enough cable to transmit that power, and keep the cord as short as possible. This will save you maintenance costs on your compressor. Got a question about this basic compressor maintenance guide? See the compressor brand pages and the troubleshooting pages on this site for the best place to post your question.